In 2014, Crosley and Bushkirk were sentenced to 81 years for the murder of Katelyn Wolfe. Monday afternoon, Indiana conservation officers found a body in rural Greene county that matched the description of Katelyn. Linton Police Department arrested, Randal E. Crosley and Jordan W. Buskirk in connection with Katelyn’s death. The police stated that Katelyn knew the two men. Previous story: Katelyn Wolfe, 19, from Linton, Indiana in Greene County has been missing since June 6, 2013. She was last seen or communicated with about 3 a.m. Thursday in the area of C Street NW in Linton, according to Linton Police Chief Troy Jerrell. A search party is being initiated by the Finding Katelyn Wolfe Facebook page. They have so far searched the Greene-Sullivan State Forest area and will be searching in Sullivan today. 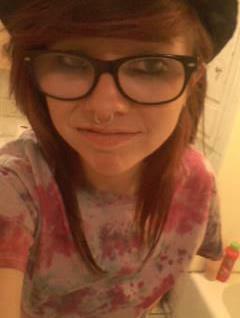 Kately is 5’2″ tall and 110 pounds and she wears glasses and a nose ring and has black hair. She is believed to be wearing a black and white-striped shirt and blue jeans. If you have any information, please call the Green County Crime Stoppers at 812-847-5463 or the Linton Police Department at 812-847-4411. I regret to inform followers of this case that the Linton Police Department has found a deceased young female in rural Greene County to be that of missing teen Katelyn Wolfe.